Post Card from Olympia, WA. Greetings from Olympia, WA. The weather is typical for the Northwest this time of year. It is around 50 degrees, drizzling – smell of wet leaves and wood burning stoves. Olympia is still the grooviest place around. 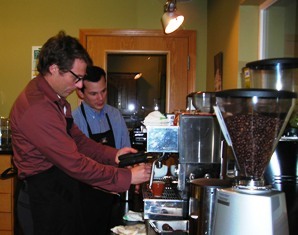 My first full day was amazing and filled with new knowledge and excitement around our continued excellence with coffee and espresso. I drank so much espresso and coffee today that I am currently running laps up and down Mt. Rainier without even breathing heavy! Michael and Oliver were my mentors today. These guys are typical of the Batdorf and Bronson legacy – Great People, Passion and Excellence! 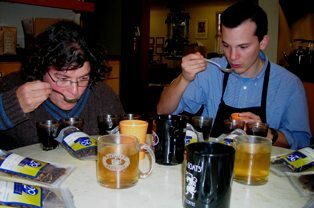 After 7.5 years I continued to be honored to have them roast our coffee. So here are a few more pictures from today and I will write about all the new changes we will implement to serve you some of the finest coffee on the East Coast. 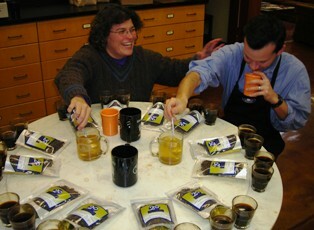 Amy and Oliver cupping all the yummy coffees and us after way too much coffee! Having a great time wish you were here. Cooooool beans Amy. It looks like fun. Enjoy the jolt! Hey Amy, if a picture tells a story, seems to me you're having waaaaaay tooooo much fun! that's what it's all about. see ya sat. Like the post card concept. Have fun! This is why your coffee is the best! This is place where slurping is good. manners! didn't your mern teach you that slurping is rude?! The weather is here, wish you were beautiful! Bring me back something purdy!